About three years ago, Stacy helped a friend research backyard chicken keeping. After learning so much about urban egg hens, she was inspired to build a coop in her Eagle River yard and ordered a shipment of chicks. When Stacy and her husband were building the run area, they chose to leave two dead cherry trees in the ground and build around them. 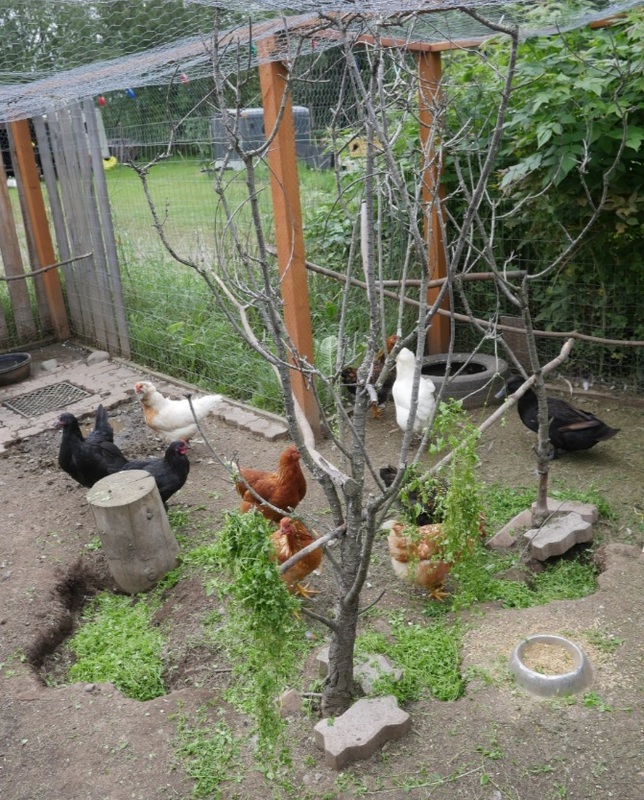 Those small trees are now a fun spot for her chickens to receive hanging treats, like chickweed from around the yard. 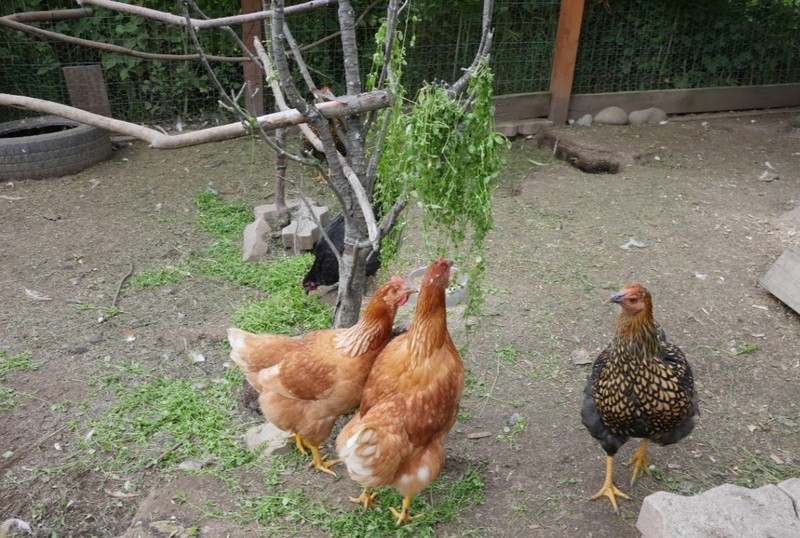 When Stacy hangs chickweed from the tree branches, her hens have a blast hopping around, tugging it down for snacks. It’s great entertainment for them and the whole flock gets into it. Stacy started with just chickens but now has two female ducks, too. She loves the variety of eggs, and thinks the duck eggs actually taste better than her chicken eggs. 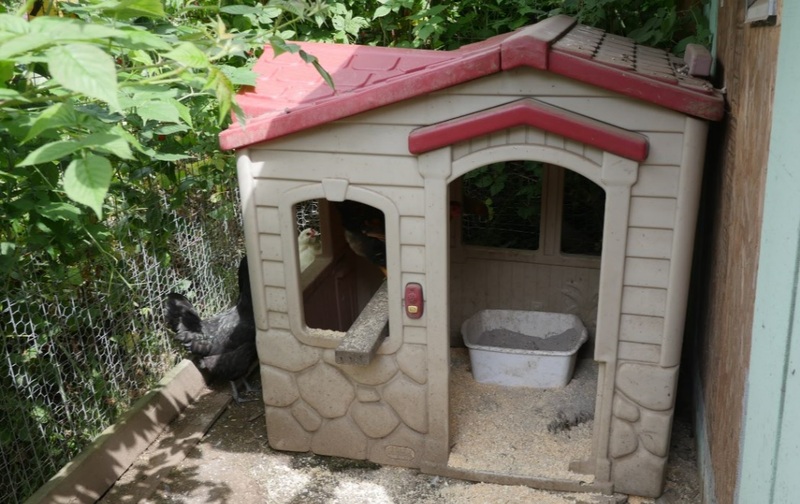 Her coop and run area have some special accommodations to make the living space work for both chickens and ducks. kiddie pool – ducks need water to be happy. 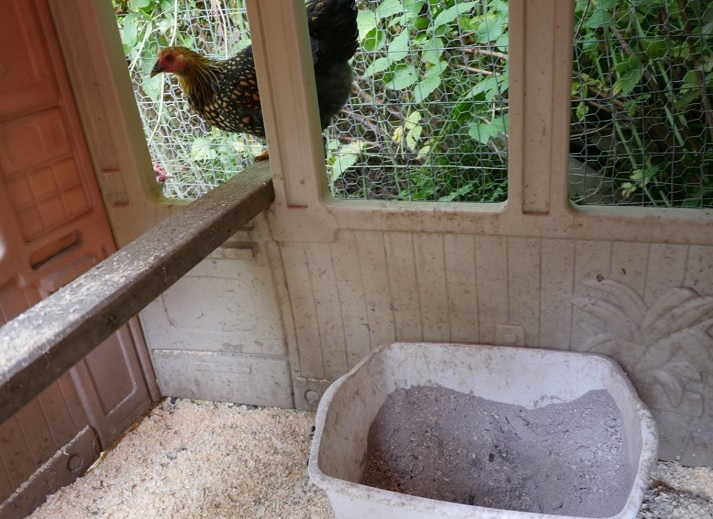 chicken feed and duck feed – she says she goes through the duck feed faster because the chickens generally prefer it, but she offers them both. 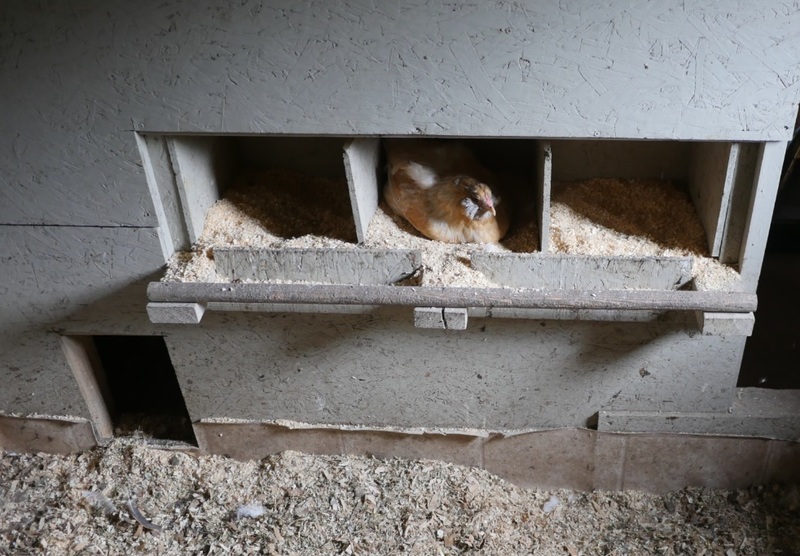 separate nesting boxes – the nesting boxes for her hens are elevated so the ducks can’t reach them. She has a separate ground-level nesting area for the ducks. 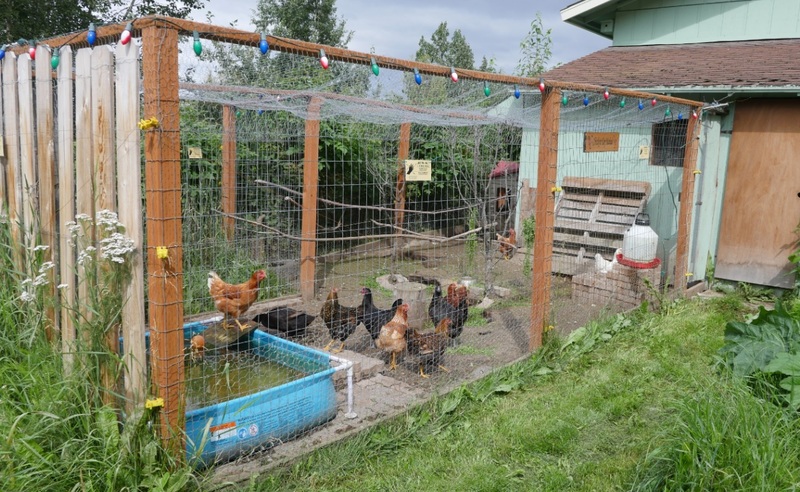 raised waterer for chickens – to avoid the ducks quickly dirtying it. Whenever ducks have access to water, they quickly make it dirty. 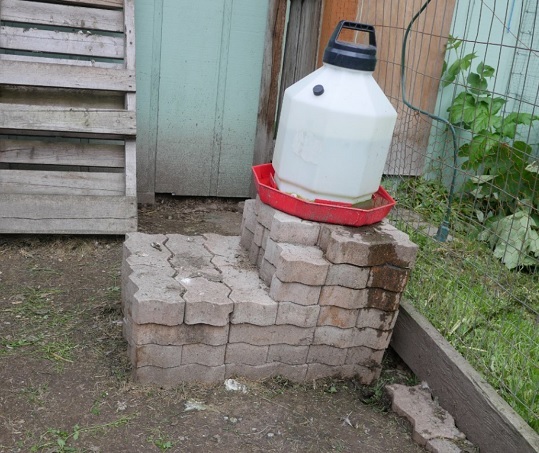 To avoid having ducks put bill fulls of dirt and mud directly into the waterer, Stacy raised the chicken water container by putting it up onto several layers of bricks. This way her chickens can hop up and reach it, but her ducks can’t make it dirty quite as easily. 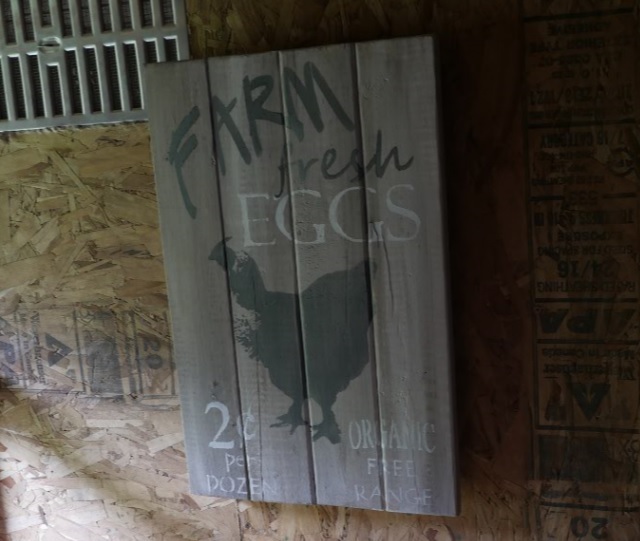 Here’s a photo of the chicken nesting boxes inside the coop. The small doorway on the bottom left of the photo leads to the ground-level duck nesting box area. When Stacy’s uncle had a playhouse he was going to get rid of, she quickly claimed it for her chicken run. It’s set up on one side of the run area and has a dust bath bin inside of it full of wood ashes, DE and dirt. Surrounded by raspberry plants working their way through the fence, the children’s playhouse works great because it keeps rain out of the dust bin, ensuring her hens always have a dry dust area to play in. And they sure do love it. One side of her run is lined with tall raspberry plants that have started reaching inside of the run, offering the chickens fresh raspberries as treats, which they happily pluck off the ripe canes. Her birds go wild for raspberries! When Stacy is picking the hard-to-reach raspberries for them, it’s very clear they know exactly what she’s doing and start getting excited, following her around, begging. Here’s a hilarious video clip of one of her hens hopping straight into the air to grab a raspberry out of her fingers. One day she was out in the coop with her hens and a black bear walked up to the run. It put its paws up on the side of the fencing and shook it, like it was testing the strength. After the black bear noticed Stacy there and made eye contact, it slowly backed away afraid, but as soon as she ran into the house and looked out the window, the bear came back. Stacy scared the bear off and immediately put up an electric fence. That has worked really well to deter bears. 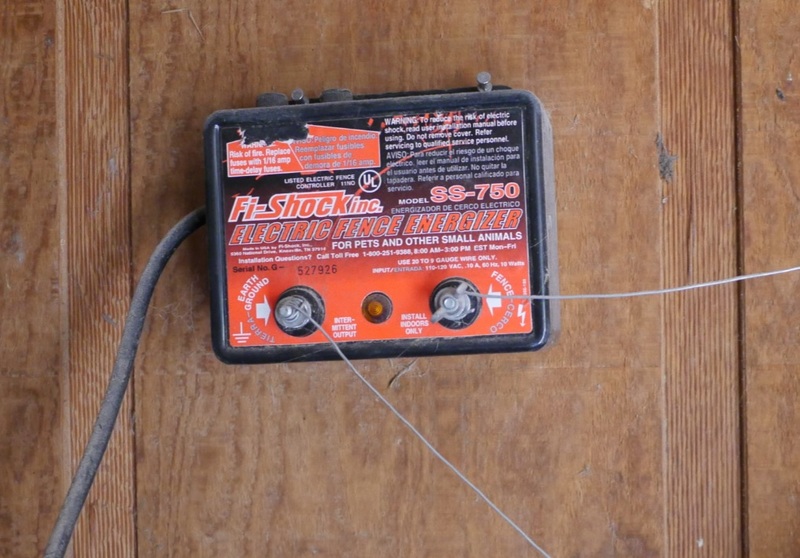 The electric fence has a main box that she keeps in the inside coop storage area and it plugs into an outlet. The wires then are routed outside and wrapped around the coop for protection. 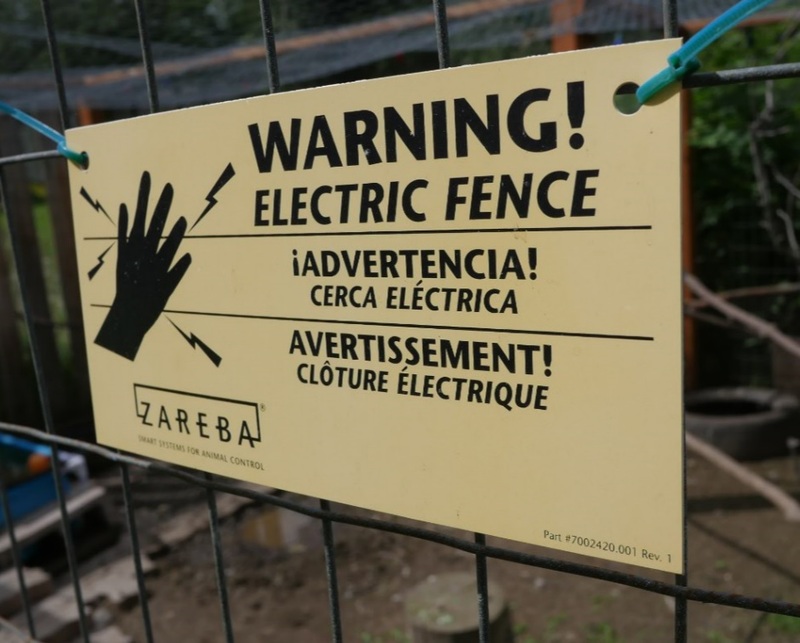 The electric wires wrap around the coop and are held in place by yellow plastic holders. 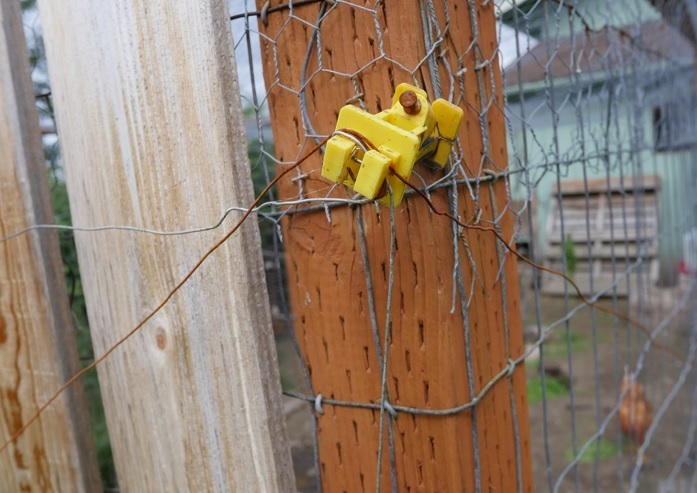 These yellow pieces hold the wires and there are several of them around the outside of the chicken fence. The top of her coop is covered in chicken wire, a preventative safety measure for her hens, because she’s constantly seeing owls, eagles and hawks in the yard. All of these predators – the bears and the aerial predators – are the reason she chose to build her coop with a large run, but not let her hens free range. Everything likes to eat chicken, and she’s confident her chickens would be quickly eaten by something if they weren’t in the safety of their fully-fenced run area. Stacy’s coop and run are peppered with adorable, funny chicken decorations. Walking through, inside and out, was a treat that had me giggling. 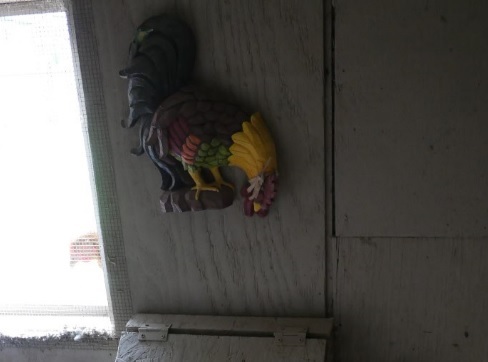 Then there’s piece of rooster wall art in the coop, directly above the feed and grit dispensers. 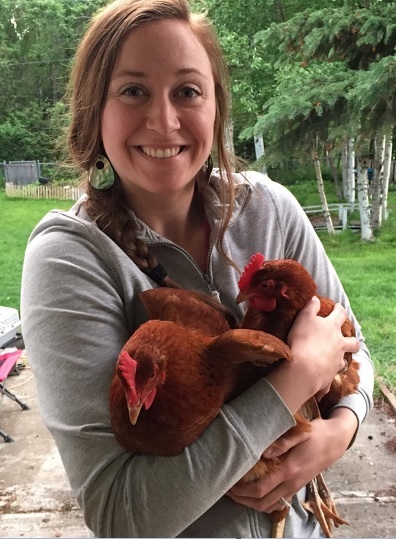 Stacy’s years as a backyard chicken owner in Eagle River have been a positive, fruitful experience. If you live somewhere urban-ish and are interested in having your chicken coop featured, please click here to contact me! 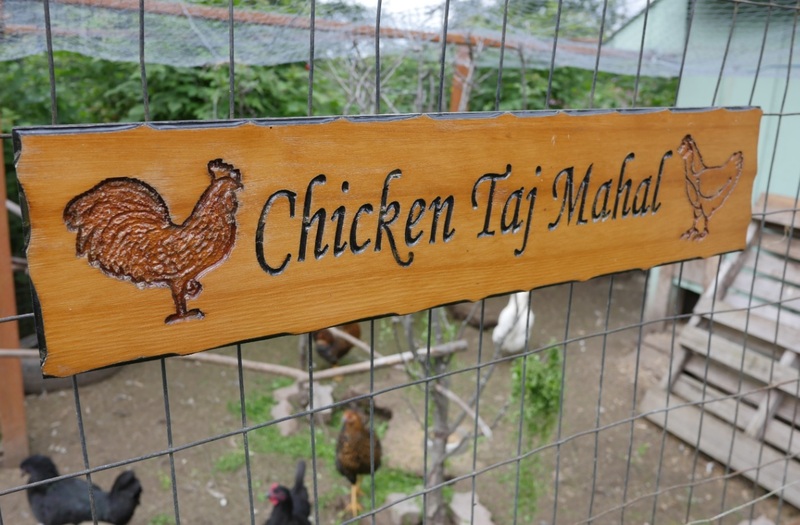 I love your sign Chicken Taj Mahal! Where did you get that?